Jos — President Muhammadu Buhari yesterday said the crisis on the Plateau should not be given a religious coloration, even as he reiterated his commitment to protect the lives and properties of every Nigerian. 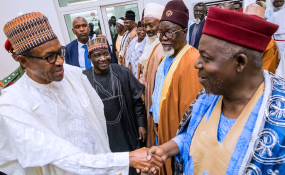 Buhari was accompanied by the Minister of Defence, Mansur Dan-Ali; Minister of Interior, Abdulrahman Dambazau; Minister of Information, Lai Mohammed; Governor of Niger State Sani Bello, and his Kebbi State counterpart, Atiku Bagudu. Also in the president's entourage were the Chief of Air Staff, Air Marshal Sadique Abubakar and the Inspector General of Police, Ibrahim Idris. The president said having sought to be president four times, "it is my responsibility to protect the lives and properties of every Nigerian and I cannot run away from it." Lalong noted that the President's visit coming less than 24 hours after that of Vice President Yemi Osinbajo was comforting and gives the people the confidence to open up their grief. The governor expressed concern at the kinds of sophisticated weapons used in the attacks stressing that from the evidences on ground and the narrations of victims, the arms were not conventional to "our environment for self-defence but reflective of a terrorist invasion."